Less than 3 months ago, a Staples High School student suffered cardiac arrest while watching a soccer game. Quick action by trainers and bystanders — including CPR, and the use of an AED by the father of a player — saved the teenager’s life. An equally speedy response has brought dozens of AEDs — portable defibrillators — to every school in Westport. The Adam Greenlee Foundation — named for another student brought back to life a year earlier — partnered with the school district and Westport PAL. Within weeks, they’d raised over $85,000. Last week, 26 AEDs were installed in school gyms and other important locations. The one below was mounted near the Staples cafeteria. Another 22 AEDs, with travel cases, were given to schools for use on field trips and sports events outside of Westport. This spring, 17 more will be installed in outdoor cases, for athletic fields and recess areas. Ten others have been given to PAL, for use at sports events outside town. It was an amazingly rapid — and crucial life-saving — community effort. Just imagine: If the state Department of Transportation worked at this pace, the Merritt Parkway North Avenue bridge would already be repaired. The North Compo/Main Street/Clinton Avenue realignment would be finished. And the Bridge Street bridge renovation would be over and done, somehow pleasing every single Westporter. 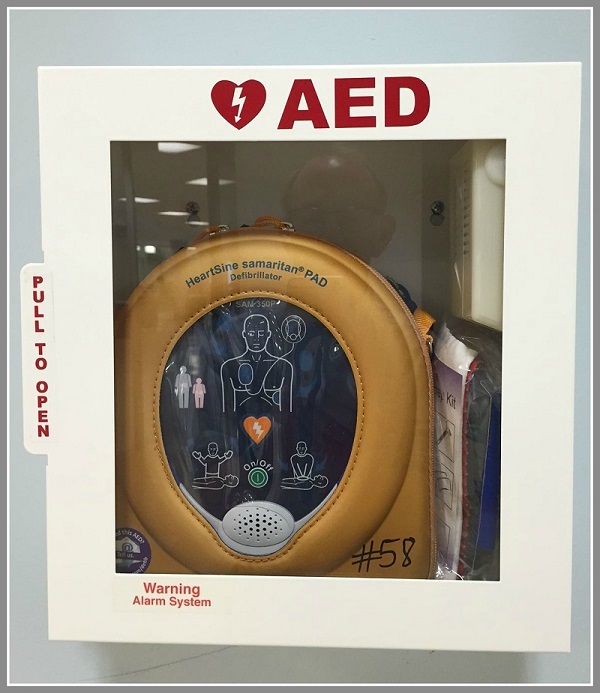 This entry was posted in Children, Education, Sports, Staples HS, Teenagers and tagged Adam Greenlee Foundation, AEDs, Westport PAL, Westport school district. Bookmark the permalink. Are the Westport Little fields on Compo Rd one of those sites? Great job!!! This is wonderful news! Yes, and the one bridge that was recently completed with minimal delays, in neighboring Weston near the Cobb’s Mill Inn, would not be falling apart with pieces falling off of it already. Thank you for your amazing speed and generosity! A donation in the name of my late father, Warren Wilson was made to the Adam Greenlee Foundation. His father and younger brother died of heart attacks and thus, I’m certain that he would be pleased to know of the success of the Foundation. Thank you, Dan Woog for spreading the word via 06880. Wow, 26, that is amazing. Many thanks to all involved! I am so thrilled that the school system is moving forward with safety. 10+ years ago when nursing staff suggested instillation of the AEDs in (at least) the health offices every excuse was offered up as to why we couldn’t. Happily public and private support has ‘encouraged’ the school system. True. I remember going to one of Diane Farrell’s brown bag lunch meetings and hooking myself up to an AED trainer to show how they worked. The resistance back then (not from Diane) was strange but I’m glad it’s over.